The X-Act Platform: Using Metrics to Guide Decisions | How to Guide shows how companies use the advanced analytics and emulation capabilities supported by X-Act platform to identify how dynamic complexity leads to system limits, diagnose the root cause of limits and determine the best remedial actions by weighing the benefits, complexity and cost of proposed solutions. The analytics and emulation capabilities supported by X-Act platform arm business and technology leaders worldwide with the foresights they need to confidently respond to changing system dynamics and clearly understand which (and when) preventive and opportunistic actions should be taken to ensure the continuous efficiency and cost effectiveness of operations. Using accurate, representative and reproducible models of business processes, applications and infrastructure, X-Act platform delivers an end-to-end emulation of a service that accurately represents the behavior of system dynamics. The emulation replaces structures, characteristics and behaviors by perturbations exerted on dynamic equations through multiple order perturbations on dynamic coordinates such as volume, service quality and cost. This is very complex math, but it is handled entirely by X-Act platform. Once a system is transformed into an emulation, it allows users to quickly test and economically explore an unlimited number of scenarios that would otherwise be complex, expensive or even impossible to test on a real system. In comparison to other practices, such as simulation, emulation is superior in its ability to accurately replicate a system, but its biggest advantage is that it allows for the discovery of previously unknown patterns, which cannot be determined using any other method. Now users can emulate risk because X-Act platform can mathematically reproduce unknowns that may happen under certain conditions. Once the emulation process is complete, X-Act platform users can change variables—such as volume, architecture and infrastructure or perform sensitivity predictions on changing process dynamics—to observe the outcomes (even when we have no historical record of these events ever happening). Discovering the cause and effects of dynamic complexity is foundational to our universal risk management approach. Since conventional methods ignore the unknowns, risk often appears as a surprise that may potentially impact operational performance. To predict risk and anticipate the appropriate course of treatment, we must discover these unknowns and determine their current and future influence on system behavior. 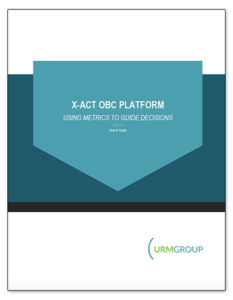 The X-Act platform: Using Metrics to Guide Decisions | How to Guide shows how companies use the advanced analytics and emulation capabilities supported by X-Act platform to identify risk and take remedial actions by weighing the benefits, complexity and cost of available solutions.